Moments after Andre De Grasse raced to bronze at the world championships against one of the finest 100-metre fields ever assembled, the questions began. What's next? Will you turn pro? Moments after Andre De Grasse raced to bronze at the world championships on Sunday against one of the finest 100-metre fields ever assembled, the questions began. What's next? Will you turn pro? The 20-year-old from Markham, Ont., faces a huge seven-figure decision over the next few weeks — whether to run his senior season at the University of Southern California, or sign with one of the dozens of agents clamouring to work with the young star. De Grasse has talked about returning to school in the past, but didn't sound so sure Sunday night. "A lot has changed right now. I just got a bronze medal. I've got to talk to my coach and make what's best for me and my family, so we'll go from there," De Grasse said. "Whatever my mom says, that's my goal, to get my degree first," he hastily added. 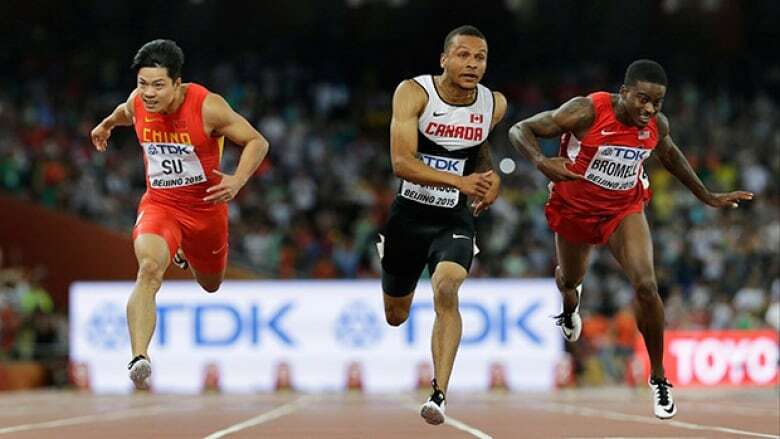 De Grasse was offered a seven-figure shoe deal, a source told The Canadian Press back in June — well before Sunday's breathtaking race for bronze at the Bird's Nest Stadium, and even before his double-gold Pan American Games performance in July. He's a marketer's dream. The track and field version of basketball star Andrew Wiggins, De Grasse is young, humble, likable and oozing with potential. And the 100 metres is the glamour event of the Olympics, a race that determines the world's fastest man. "Everyone is trying to sign him," said Kris Mychasiw, managing partner of Sprint Management. "If he said he wanted to go pro, and that he wanted to sign with us, I'd do somersaults around the Edge Walk." A shoe contract typically covers a several-year cycle that includes an Olympic Games and a world championship. But De Grasse stands to make money on more than just the brand of shoes he wears. Mychasiw, who works in partnership with Canadian sprint legend Bruny Surin, estimates De Grasse could earn much as $700,000 in endorsement deals in 2016, and could ink a shoe contract worth an additional $700,000 a year. "The shoe deal is security but he would be very valuable in an Olympic year," Mychasiw said in an interview from his Montreal home. "Companies like SportChek, Proctor and Gamble, et cetera would be interested to work with him as they are big partners of the [Canadian Olympic Committee]. He would also command a very healthy appearance fee at meets." Usain Bolt, track and field's richest athlete, commands as much as $400,000 to race in a meet, Mychasiw said. The Jamaican superstar, who edged Justin Gatlin for 100-metre gold here, went out of his way to congratulate De Grasse in the broadcast area Sunday night in a momentous gesture. "When you get acknowledged by Bolt, it means you're the real deal," Mychasiw said. It's been nearly two decades since Donovan Bailey and Surin were racing to Olympic and world medals. Canada hasn't had a world contender since. De Grasse is only the third Canadian to run a sub-10-second 100 following those two, and his bronze was the first world medal for Canada in the 100 since Surin raced to silver in 1999. The 100 metres, Mychasiw said, is a "legacy event" in Canada. "Donovan and Bruny set such a high standard of excellence, and it took nearly 15 years for anyone in Canada to run sub-10 and for him to run it five times so far in 2015 shows he's not a one-hit wonder," Mychasiw said. "Heading into Rio, he will be considered a medal threat." His mom Beverley De Grasse said recently she'd prefer he finish his degree before going pro. Mychasiw said the sprint star could have the best of both worlds. While going pro would make him ineligible to compete in the NCAA, it wouldn't prevent him from continuing to attend school. "I'd sign, capitalize on the endorsements, and stay in school," he said. "He can continue to get an education, be an assistant coach at USC, work with the team that's done a great job with him. "Track is such a different sport, one day you can be top, tomorrow a career-ending injury." Andre De Grasse: What did I just do?